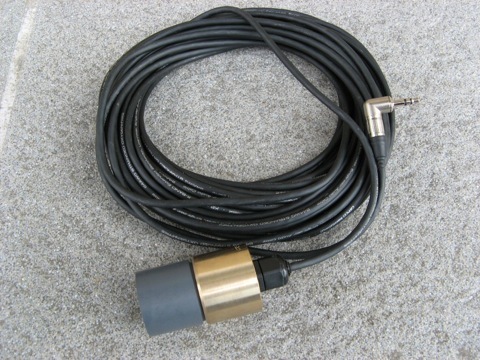 This hydrophone is a general purpose hydrophone ideal for whale watching, full audio-band signal detection, and mobile underwater recording. This hydrophone has a slick & compact design. It is manufactured by Sensor Technology in Canada. The SQ26-08 must be used with a recording device or preamplifier that has a bias powered (plug-in-power) microphone input. A custom adapter allows to directly power the internal preamp, to be used with systems not providing the bias power. Applications: Kayaking, Recreation, Tourism, Environmental science, General cetacean research, Educational outreach programs, Contact microphone, Geophone, Capturing the sounds of the natural underwater environment for eco-art, Adding underwater sound to video recordings. Dimensions [mm]: 70 L x 32 dia. SQ26-08. The mini-jack connector may vary from the one in the picture. 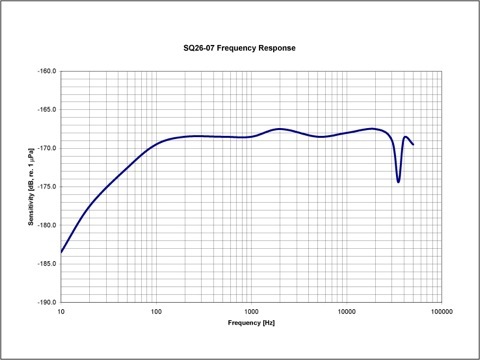 SQ26-08 Frequency Response, tested on series production.